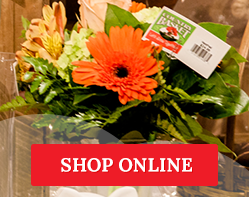 Give the gift of flowers with a $50 Country Basket Gift Card. This gift card may be used for making purchases at both the Country Basket Flower Boutique and the Country Basket Garden Centre. If you’d like a Gift Card in another denomination, please get in touch with us. Terms & Conditions: Except in certain circumstances, the value on this gift card will not be replaced if the gift card is lost or stolen. This gift card has no cash value. Use of this gift card constitutes acceptance of these terms and conditions.